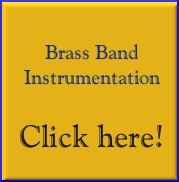 This is the Second Section test piece for the 2012 Regional Contests of the British Brass Band Championships. Commisioned for North West Open B.B. Championships - sponsored by Pilkinton plc in conjunction with Rainford Silver Band. The "Cross Patonce" is the logo of Pilkington Plc. This work is a suite in three movements performed continuously throughout. Click on "MORE DETAILS" to listen to audio extracts of the different movements and to view the Solo Cornet part. mp3 example 1, is the start of the first movement. m33 example 2, is part of the lilting 3/8 solo and tutti passages of the first movement. mp3 example 3, is the start of slow lyrical second movement, with solos starting on euphonium and passing to solo horn and then to solo cornet - this process is then repeated by 2nd. trombone, 1st. trombone and finally flugel. The movement changes meter frequently between sometimes 4/2, 3/2, 2/2 and later 5/2, 6/2 and 4/2. mp3 example 3, is the start of the third and final movement - Vivo, which starts with antiphonal effects between upper and lower band.